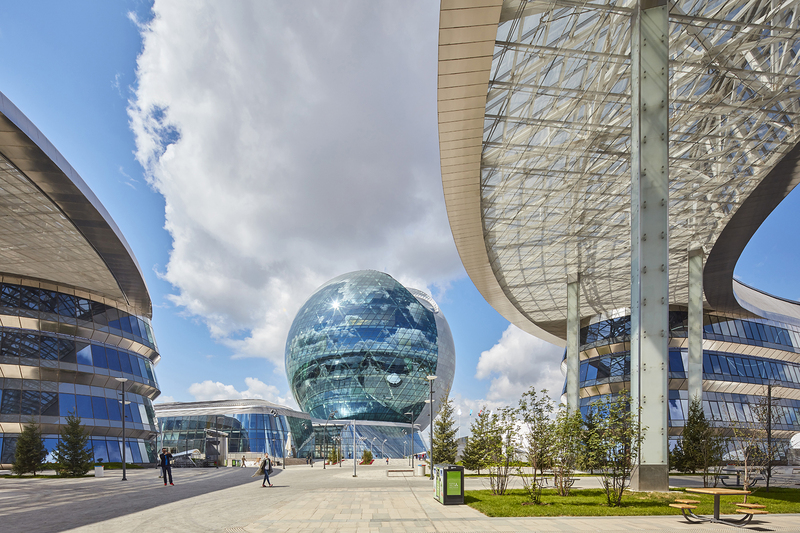 The Kazakhstan Pavilion + Science Museum is the iconic, high-performance centerpiece of EXPO-2017, the site of the 2017 international exposition, which runs from June 10-September 10. Inspired by the EXPO-2017 theme, “Future Energy,” the Kazakhstan Pavilion and Science Museum embodies a futuristic design that is optimized to incorporate sustainable philosophies. Adrian Smith + Gordon Gill Architecture (AS+GG) won an international competition to design the master plan and multiple buildings for EXPO-2017. 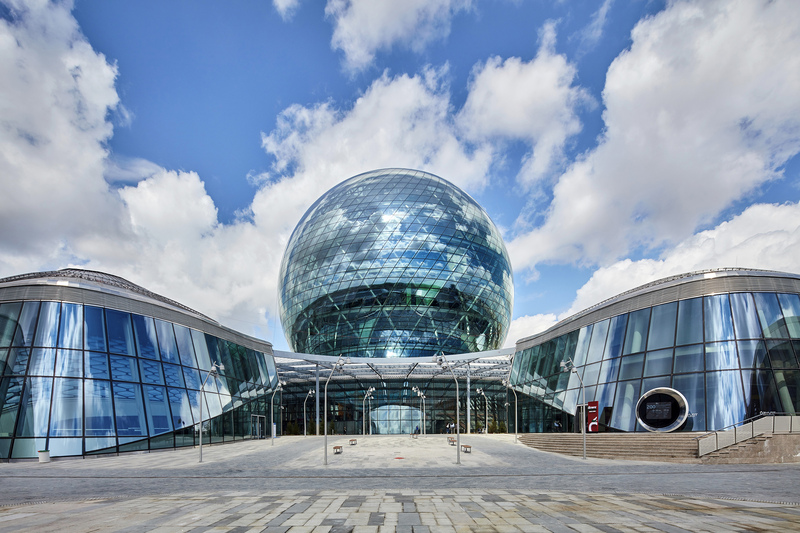 The spherical-shaped Kazakhstan Pavilion and Science Museum was developed as a way to accomplish the client’s goals of a spherical-shaped building, while enabling AS+GG to push the design forward to meet the firm’s programmatic and sustainability goals. 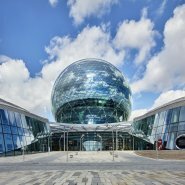 A pure-glass sphere was envisioned—one that was smooth, not faceted like a typical geosphere structure. The Kazakhstan Pavilion and Science Museum’s innovative, double-curved-glass facade features glass panels that gently curve in three dimensions. To achieve these results, the glass fabricator heated the glass in special ovens until the material was soft enough to take the form of a mold and then slowly cooling the glass. The 80-meter-diameter structure is slightly modified from a perfect sphere shape in order to achieve substantial renewable-energy goals. 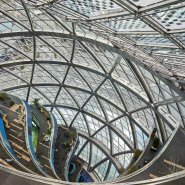 The building’s form was tested and modeled to determine how to minimize energy use, maximize daylighting, control glare, and take advantage of renewable sources with integrated photovoltaics and wind turbines that create energy for the building. 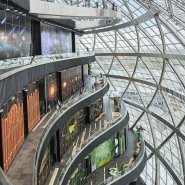 Building Integrated Photo Voltaic cells (BIPV) were installed at the top of the sphere to generate renewable energy for the building. During the testing phase, the energy model predicted 81,056 kwh/yr of electricity or 2.21% of total energy demand. To further improve energy generation, a scoop was carved out of the building’s top on for wind turbines. Predominant southwest winds are channeled to activate the turbines that were designed specifically for the harsh winter conditions of Astana. The turbines are predicted to produce a total of 52,700 kwh/yr of electricity or the equivalent of 1.6% of the buildings total electricity demand or 0.9% of total energy demand. 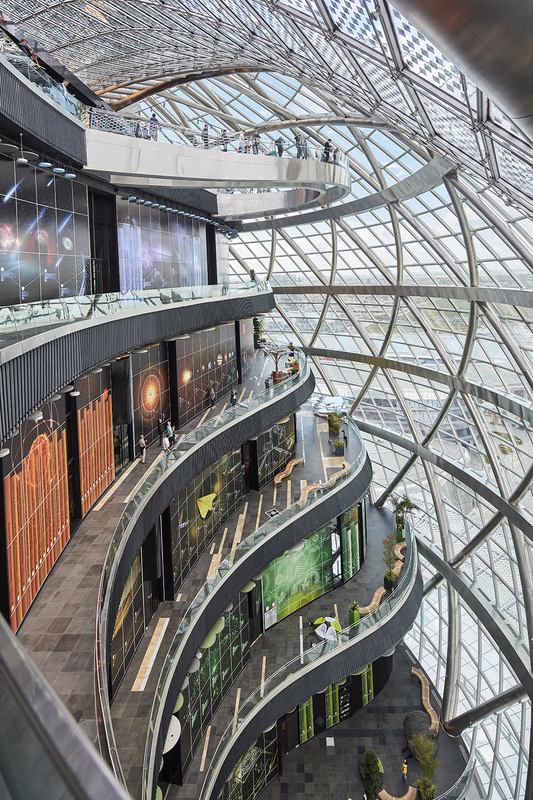 Levels 2-7 will be designated exhibition floors, and level 8, the highest floor, will be an event space and viewing platform with optimum views toward Astana. 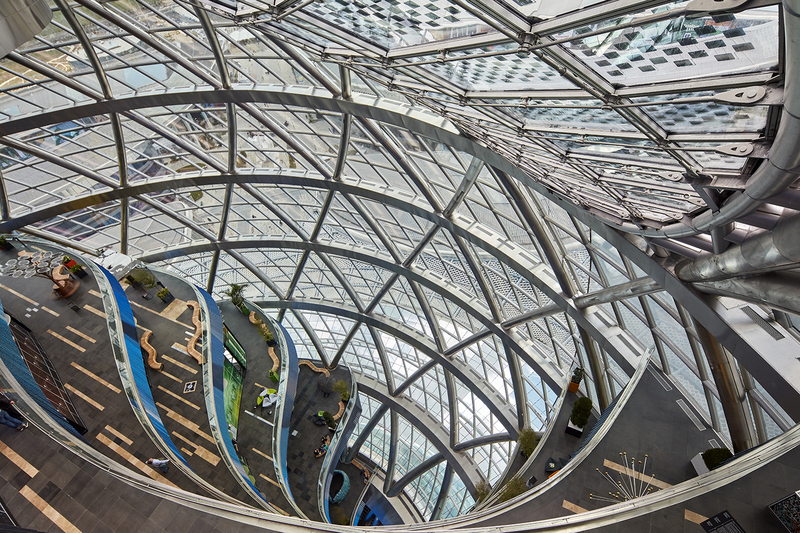 From this floor, visitors will have a direct visual experience with renewable energy as photovoltaic panels and sophisticated wind turbines will be integrated to the building at this level. Once the EXPO-2017 completes, the site will be transformed into a Post-Expo development with an office and research park and residential components that will seek to attract international firms and entrepreneurs. 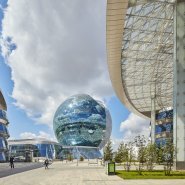 Can a Giant Science Fair Transform Kazakhstan's Economy?